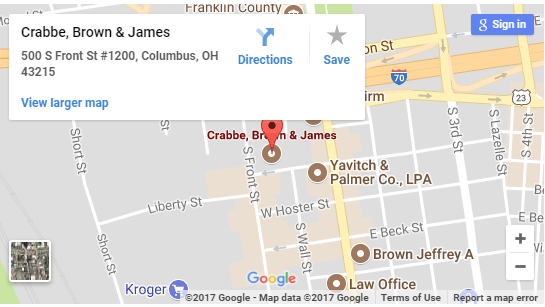 The team at Crabbe, Brown & James is always looking for dedicated and sharp legal professionals. Whether you’re an experienced attorney looking for an opportunity to join a passionate team of advocates, or you are looking to secure a legal clerkship at a thriving law firm, we want to hear from you. Our firm is always looking for top caliber legal minds to join our growing legal practice. In return, we provide an opportunity for lateral attorneys to thrive in a collegial mid-sized Columbus, Ohio law firm. Our sophisticated and diverse legal practice will be both challenging and rewarding for any attorney joining our ranks. Specifically, Crabbe, Brown & James is always looking for attorneys in evolving practice groups, as well as within our established practice areas. We often hire lateral attorneys that bring further specialization to our existing practice areas or new practice areas altogether. We are also constantly seeking qualified candidates to assist in our ever-expanding corporate and defense litigation departments. Crabbe, Brown & James LLP maintains an active program for law students in the form of a legal clerkship. Law clerks at Crabbe, Brown & James are exposed to an immersive legal environment where they will learn a great deal about how the practice of law actually works from a law firm perspective. Clerks will be exposed to at least some of the following: drafting legal memoranda for pressing client issues; drafting or responding to discovery requests; drafting correspondence to opposing counsel regarding specific matters of a case; attending depositions, hearings, and trials; researching cases and statutes related to client matters; assistance in drafting motions to dismiss; assistance in drafting motions for summary judgment; aiding clients in submitting zoning or variance applications for developing real estate projects; and assisting on United States Supreme Court amicus briefs filed on behalf of our institutional clients. This experience will expose law clerks to many diverse assignments and areas of legal practice.